...cheers to the New Year! .....shine in the light that you are! I love watercolor. It is the medium that defines me as an artist/illustrator. Right now i am playing with Adirondack Color Wash and Distress Ink reinkers from Ranger as watercolor paints. Since both products are water based, they can be thinned and stretched with a water soaked paint brush. 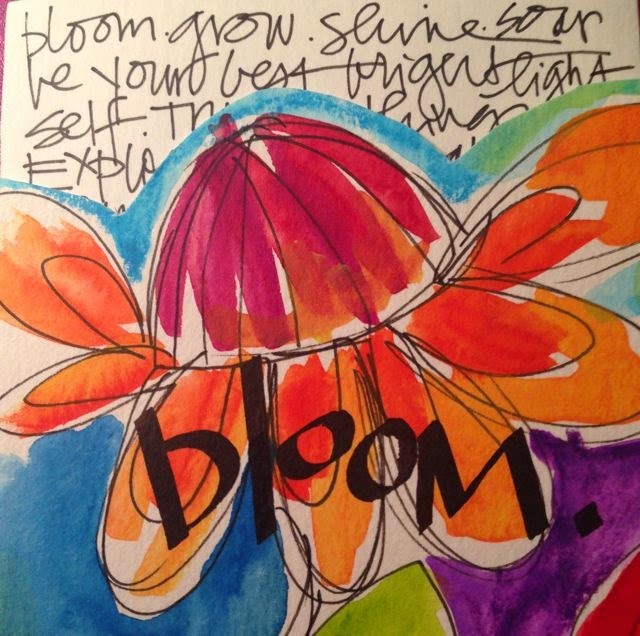 The concentration and intensity of color is a perfect base for an art journal spread. and decided to have the courage to change everything." ...back to some inky art! While we had a magical time with family and friends, so glad the holidays are drawing to a close. Now back to work i go! Finishing up my stamps, and 3 other assignments that all have to be completed from now until January 10th. For me, one of the nice things about Christmas week is the little bit of down time to "reorganize". My home studio was the winner this year! It felt good to take a little inventory of the "stash" and supplies i have, that will inspire new directions and ideas in the New Year. I get the most satisfaction from the creative process in my journals, exploring with paint, ink, spray, color, drawing etc. Colorful pages stay blank from the journaling part, waiting for writings to be inserted later. Here are two pages that have been awaiting their 'written wisdom' for months..........i finished them yesterday when i was supposed to be cleaning! On the left page spread in my Moleskine Watercolor Journal, I drew my usual whimsical flowers then painted them with my Tim Holtz Distress Ink Reinkers. Just used drops of the distress inks in a paint tray, added water and painted with a brush. These colors are so bold and rich, just how i love them! (here i used Wild Honey, Rusty Hinge, Fired Brick, Orange Marmalade, Broken China, Scattered Straw, etc) Then, the "sugar on top" is some spritzing with my Ranger Perfect Pearls Mists in "Perfect Copper". Just the perfect amount of shimmer to catch the light. On the right side page spread, i drew my winged a heart and colored the same way. Outlined with my Inkssentials White Gel pen. ...Hope you are loving your Christmas. Now i am going to reacquaint myself with Mr. Dyson and get this Christmas Cyclone of Creativity cleaned up a bit. So peace, love and joy to you today!! Wow! You know how much i love the art journal. 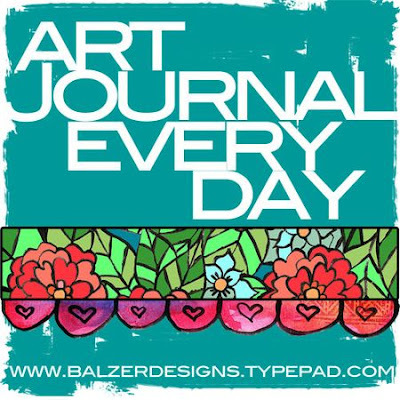 Julie Fei-Fan Balzer is a really fun New York artist and is hosting a "Art Journal Everyday" event for 2011. I just signed up, and it's FREE! It will be such fun sharing in an online community, just like having an "artsy play date" every day! Hi Joanne, That mag looks yummy! I'd say the 2 things that attract me to a blog are creativity, if they show some really cool photos or art that they are working on and if the style of the blog is colorful and whimsical. Secondly, the spirit behind it. If it is mostly upbeat and inspirational, I'll be back. I connect with that. i will get the "Gifts" Magazine out to you this week. We will have more giveaways in 2011 from Cloth Paper Scissors, so keep visiting. Thanks to all who left comments! 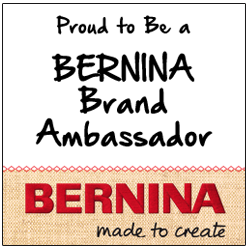 Great ideas and even greater NEW ART FRIENDS, to share our creative journey. Stay joyful and inspired! Merry "Christmas Week" to all! Okay, let's take the rest of the afternoon today to leave a comment below on the post, Cloth Paper Scissors "Gifts Giveaway!" Giveaway! Read a the post from December 15th and comment. The drawing's at 6pm TODAY! Merry Christmas week everyone! With this unfinished Copic doodle card, i wanted to take today's post to thank YOU. Thank you to the sweet peeps who comment on my blog and facebook pretty much all the time, it makes it all worth pouring my heart and soul into. Thank you to the sweet peeps who believe in my art and share it with their audience with blog links. Thank you to the sweet peeps at a magazine who are giving me the opportunity to share my personal creative reinventions with a huge audience. 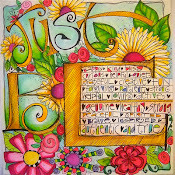 To all my new sweet blog peeps, for revisiting and hopefully getting inspired by my whimsical ramblings. The one i will say by name, thank you to my sweet friend Rena Askey, a very talented artist who sent me this original watercolor card. It's a doodle of me! It amazes me that kindred spirits always find each other. 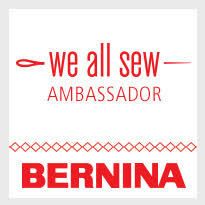 Rena was recently featured in Somerset Workshop Magazine. I am so blessed to have you all, i appreciate you, and thank you. p.s. I know this post probably sounded like a sappy Oscar acceptance speech, but it's from my heart and with YOU, i feel i have the prize already! 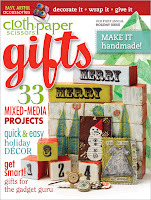 I've been invited to review Cloth Paper Scissors magazines for 2011 (what an honor! ), share my thoughts and a host a magazine giveaway on my blog for each issue. And, we're starting right now, with "GIFTS", their first annual holiday issue! This gorgeous magazine is chuck full of original projects and fresh ideas for gift giving and holiday seasonal decor, like Jenn's skates, "Mixed Media on Ice" on page 32. 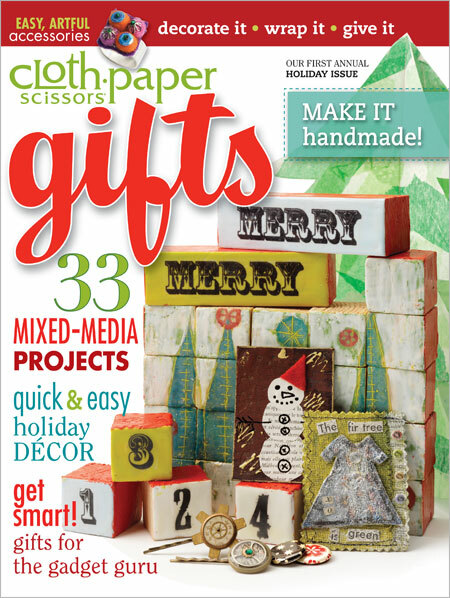 Cloth Paper Scissors "Gifts" $14.99, is a collectible, super-sized treasure at 148 pages and can be found at Barnes & Noble or JoAnn's. ...you will always find a unique spin on the most innovative creative ideas! Sunday, December 19th to kick off Christmas week! Baby it's cold outside!! Skate on over to my blog tomorrow for my very first PRIZE GIVEAWAY!! So excited to share, so see you soon! in the sea of crystal white snow (here in NY) and red and green these days. Ranger Adirondack Color wash and water. It's a quiet page, simple. So pretty, an inky whisper, it's my deep breath. ...so little time, especially this time of year! Believe it or not, this is a helpful holiday topic, journals, journals, journals! I LOVE MY JOURNALS, all of them! This pile represents the many directions my creative curiosities take me. I draw, doodle, write, paint, mist, layer, color, and more. It's a mood thing. Sometimes you're in the mood to do one artsy thing, or another artsy thing. Don't be afraid to explore, "be all over the place" with your experiments and techniques. It will help you find your creative passion, some things will feel more natural and gratifying, and others will leave you frustrated. ..."don't rain on my paraaaade"!! !